Make room on the grill for dessert, too! 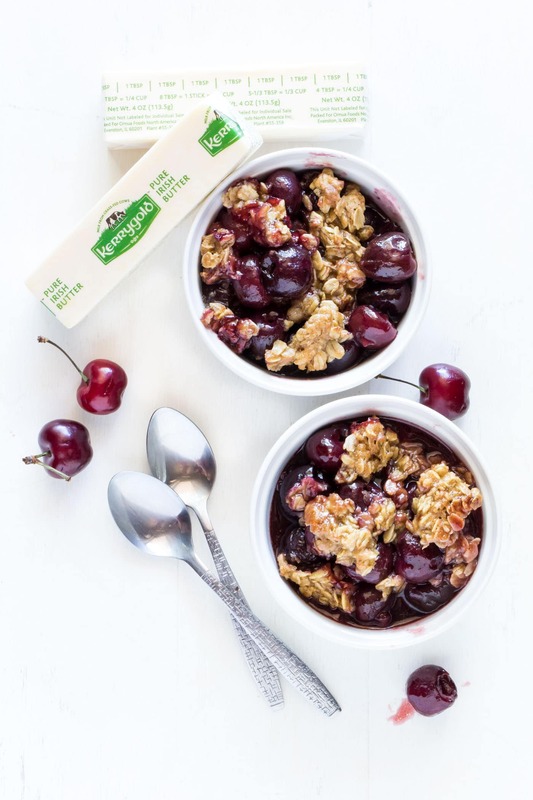 This easy Grilled Cherry Crisp – bursting with sweet cherries and a crunchy oatmeal topping – might just be the perfect summer dessert. My favorite part of this Grilled Cherry Crisp recipe is the crunchy oatmeal topping. Make with Kerrygold Salted Butter, the topping bakes on the grill and the end result tastes almost like a crispy oatmeal cookie – yum! The juicy Bing cherries need little more than a touch of sugar and some lemon juice to keep their flavor fresh and bright. 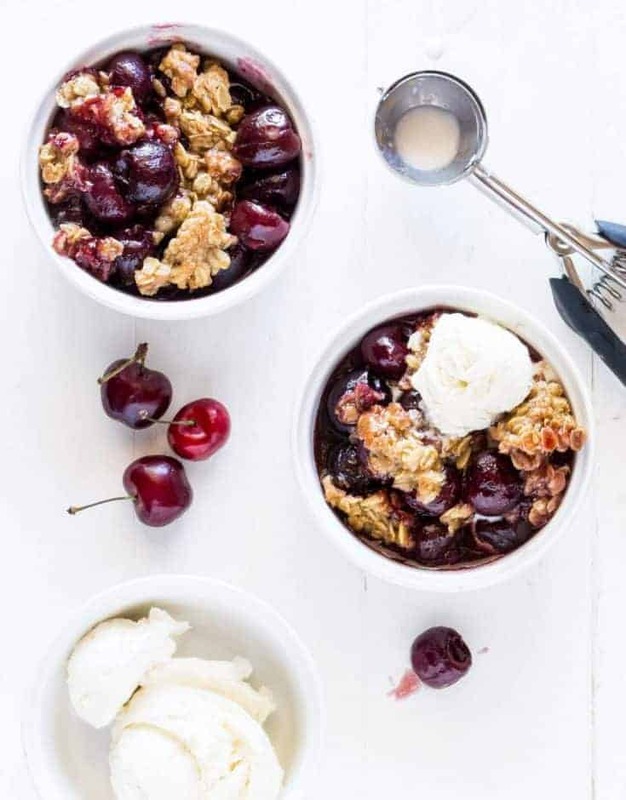 Ladle warm scoops of this Grilled Cherry Crisp into bowls and top with cold vanilla ice cream for the perfect end to a warm summer evening with friends. Tip: I couldn’t find heavy-duty disposable foil pans at my grocery store, so I just doubled up two of the thinner – and cheaper – pans that were available to insulate the bottom of the pan from the heat of the grill. P.S. Looking for more fruity desserts? Don’t miss our Rhubarb Apple Crisp and our Peach Berry Crumble! Preheat grill to medium heat. Grease an 8 x 8-inch disposable foil pan. In a large bowl, stir together cherries, ¼ - ½ cup granulated sugar, lemon juice and cornstarch until evenly coated. Pour mixture into foil pan. Add oats, flour, brown sugar and ¼ cup granulated sugar to another bowl. Stir together. Pour vanilla extract and melted butter on top of oat mixture and stir to combine. Sprinkle evenly over cherries. Cover and firmly seal with heavy duty aluminum foil. Grill for 25-30 minutes or until bubbling around all the edges. Remove foil and grill for an additional 5-10 minutes or until topping is set. Remove crisp from grill and allow to cool for 5-10 minutes. Serve warm with ice cream. I can't recommend this cherry pitter enough! Makes pitting 8 cups of cherries a much faster chore than trying to do it by hand. Disclosure: This post was sponsored by Kerrygold. All opinions are our own. We only share products with you that we love and use all the time. Thanks for supporting the brands that make Garnish with Lemon possible.